Summer is basically over, but never fear! La Yegros is making their US debut and bringing plenty of tropical heat and sick beats to the DMV. Nu-cumbia is taking the world music scene by storm and La Yegros is no exception as the first female artist signed to the acclaimed Buenos Aires ZZK records. The heart and soul of the genre is celebrated and evolved with La Yegros' thumping electronic bass, killer accordion solos and frontwoman Mariana Yegros' prominent voice. Hailing from Buenos Aires and Paris, Mariana has taken global sounds, electronica, dancehall and soul and fused them with the folkloric styles of chamamé and cumbia that speak to her to her family's roots in the rural rain forests of northeast Argentina. Following their debut album, Viene de Mi, La Yegros has embarked on their first US tour and lucky for us, they are stopping at DC's own Tropicalia on September 25th. I was immediately enchanted after hearing "Trocitos de Madera" and seeing the video, and couldn't pass up the chance to catch up with an artist as unique and awesome as Mariana. Read on and listen on, because this is a group to be watching out for! VF: What does the name "La Yegros" mean? How long have you been a band? Yegros is my paternal last name. I decided to use it as my artistic name because I feel that its pronunciation has strength and also represents my origins, of which I am very proud. The band formed in 2012 with the help of Beno Guelbert, a prestigious Argentine basist. It was him who gave me the courage to carry out the project to express the abum Viene de Mi live. Together with Beno, we began the search for the members that today make up the band- Gabriel Ostertag, Nico Deluca and David Martinez. VF: How would you describe your music? What is your writing and creative process like? My music is a mix of Latin American rhythms with electronic bases. When I compose a song, I do it in a way that is a bit formal and systematic. It's not as if I sit in a studio to create or that I take sabbatical months, but rather the songs arise from me in moments when I'm immersed in everyday life. From there they are worked on with King Coya, my musical producer and co-composer. VF: One of your songs that really caught my attention is "Trocitos de Madera." The sounds, lyrics and visuals in the video are so artistic and interesting- what was the inspiration behind this song and the video? I composed Trocitos de Madera in an everyday situation. While watching TV I saw a newscast with giant letters that took up the whole screen reporting, "a girl cries scraps of wood." From that the refrain of the song was born and later I developed a story that was adapted to my own fantasy, arranged and produced by King Coya. Later came the video made by Flamboyant, displaying a cheerful and colorful aesthetic but also with the intention to call out against the abuse of nature; in this case wood. VF: "El Bendito" is also really interesting and seems to be one of the most experimental tracks on Viene de Mi. Was the feel and sound of this track influenced alot by other ZZK artists or developed more organically? “El Bendito” was created by Daniel Martin, a great composer from the province of Mendoza. I had the pleasure of meeting him while participating in a project conceived by Gustavo Santaolalla (Bajofondo) called Terraplén. The song was produced by King Coya, an active participant in the ZZK movement. VF: What kind of reception have you received in Europe? Is there a viable tropical/nu-cumbia scene happening there? The reception in Europe is incredible! The audience sings along with us and it thrills us a lot. Their high level energy fuels us in every live show. Of course I see a viable tropical, nu-cumbia scene and see it growing gradually. 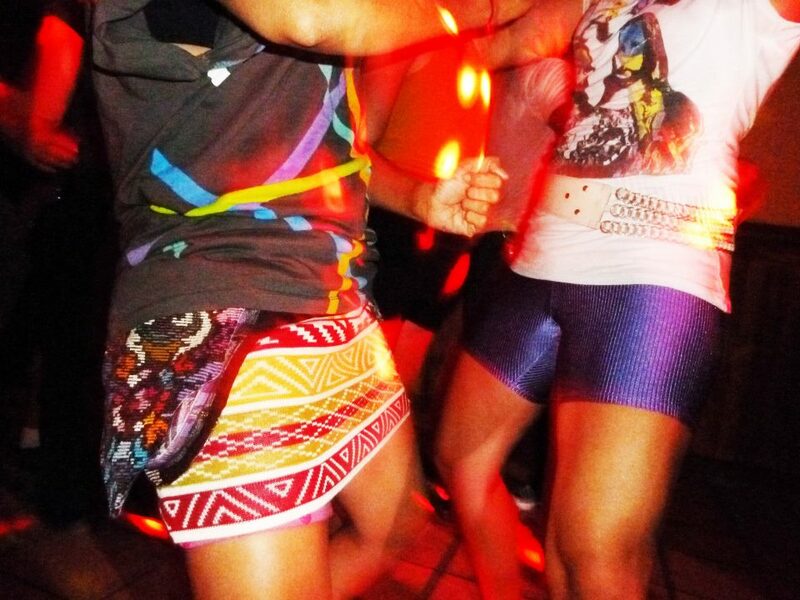 The people enjoy these sensual and rhythmic beats that transport them to Latin America, land of heat and flavor. VF: What can someone who has never seen you before expect from your live shows? The live show featuring songs from my fist album, Viene de Mi, is super power. I have the fortune to be accompanied by Argentine musicians that feel the music in a very visceral way and are 100% present to the scenario we are creating while on stage. Our clothing is designed by another great Argentine artist, Ariel Mora, who manages to achieve sophistication and folklore simultaneously with his designs; a visual aesthetic that directly refers to the concept of the album. On our tours audiences can find colors, dancing that occurs spontaneously during the concert and a flowing, musical energy that interacts with the audience that explores liberation and happiness. This is what gives me happiness at the end of a night, having made a group of people treating me with their smiles and gazes. I hope this will happen on our first tour in the USA. We are here to make you dance! Also bringing the house down will be the Maracuyeah DJ collective. Internationally known for rockin mixtape-style Pan-Latin-to-the-Future sounds that shake crowds, and mix in traditional & popular tropical rhythms that founders Djs Mafe & rAt grew up with. Their dj sets feature everything from vintage chicha recordings, cumbias rebajadas, 3ball gems from 2017, dancehall, 80s rock en español, electro-cumbia sensations, tropical booty bangers and their very own flavor- quinceañera bass. Don't miss out on La Yegros + DC's Maracuyeah Collective at Tropicalia on September 25th! Doors at 9pm, $10. For advance tickets click here.